You guys have no idea how excited I am about this post. The upstairs bathroom design makeover is finally done and it’s been such a long time coming that I’m beyond thrilled to share the whole thing!! Our upstairs bathroom also serves as the master bath. We have two bedrooms up there and one large bathroom. But because the second bedroom is a guest room and we have another full bath downstairs that’s more “public” it’s mostly us who uses this one. Which is great because it’s pretty large, and was renovated before we moved in. If you’ve been following along you know that we’ve been doing a lot of work to get the bathroom to where it is now. At first glance from the before pictures it didn’t seem too bad. But, I pointed out a few things in the before and after section at the bottom that you really noticed once you were in the room. We had a friend over recently and she said “it finally looks cohesive, before it just looked weird.” Which is what didn’t always show up in the photos. So, here’s a list of bathroom ideas that you could use for your space too! 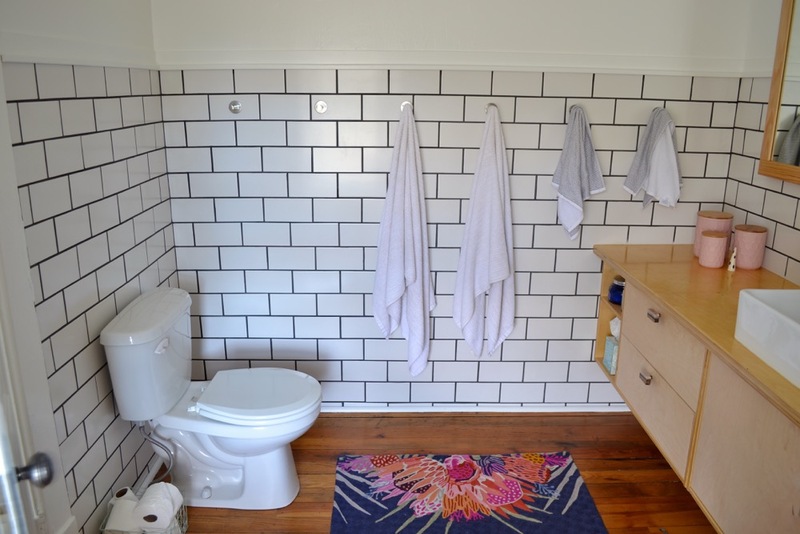 Everything was a DIY effort and were very budget friendly bathroom design ideas. It actually took completing all these projects to get the space where it is now. -Adding pulls to the drawers and cabinets. With all those things done it’s seriously like a brand new place! 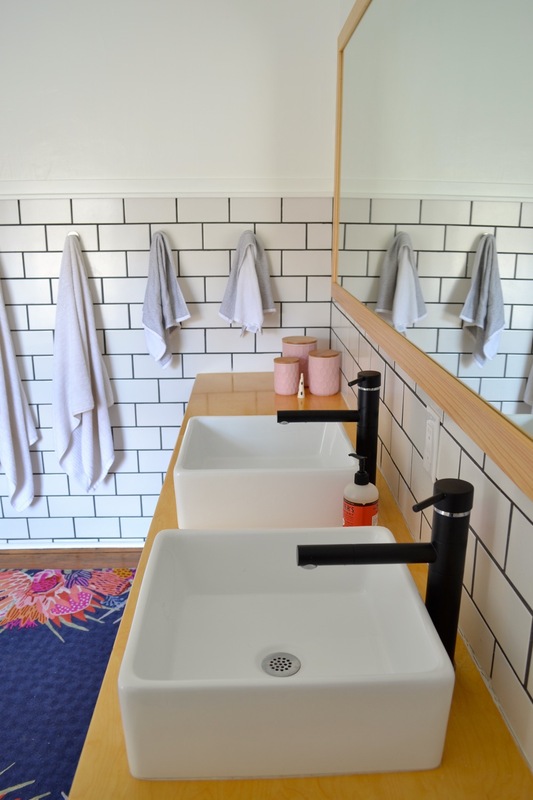 I love that the tile, vanity, and hooks feel modern but the room still has some traditional elements like the heart pine floors, claw foot tub, and original door knob that are like a little nod to its 100 year-old farm house heritage. The rug is such a perfect pop of color and pattern. If I could be personified in a color palette I think that rug would be it. Plus it was an online exclusive that had been returned to our tiny, local Anthro in the right size and was on sale. Kismet if it ever was. After using our teeny little downstairs shower for so long and constantly running up and down the stairs just to get ready I’m still happy every time I’m here. I’ve linked all the sources below. The tile was here when we moved in so I’m not sure exactly where they came from, but I included a link to something similar. The vanity looks like it’s made out of plywood and was probably done custom but on the cheap and I couldn’t find anything that really seemed similar. I hope you love our master bathroom design as much as I do!